It’s the close of another Memorial Day. As I sit here to write before turning in, I am thankful to have spent the day with family. Memorial Day means more to me than it use to. Three years ago we lost my brother who served in the Infantry Division of the Army. I hope that I have honored his memory today. He was my hero. He reenlisted in October 2002. It was 9/11 that caused him to go back. He was just a few miles behind the first wave that rushed to Bagdad. I have seen the pictures of him sleeping in the streets and the cramped sitting in the back of the Bradley vehicle. He was a warrior. He was a squad leader that went house to house looking for “bad guys”. 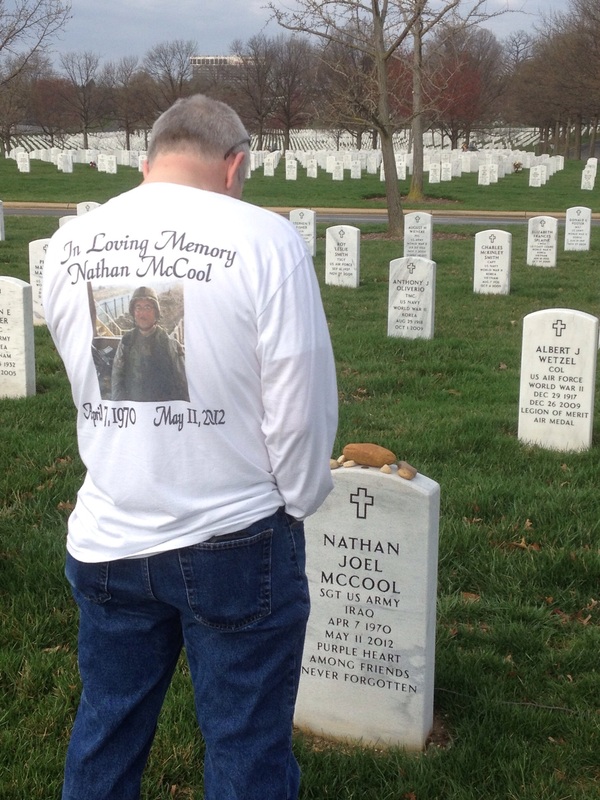 I remember the day my parents came to where I worked and told me Nathan had been shot. We would find out that he was hit by a sniper. He would spend four months at Walter Reed Medical Center. Because he wasn’t married, the Army would fly my family to see him once a month. My parents went to Walter Reed and stayed by his side for the duration of his stay. I was able to fly in every other weekend to be there with them. Nathan never completely recovered. He was plagued with back pain and there was fragments from the bullet that they never took out, one because it was close to his heart and they decided that it was better to not disturb it. Nate decided when he was discharged, to move to Clarksville Tennessee, where he would have been stationed at Fort Campbell. If you knew my brother, you know that he could be ‘matter of fact’ to say the least. He was a giving person. He never complained about money and to be honest I thought he was better off than he really was. He died suddenly in 2012, almost six years after being shot. I have read the autopsy report and Nate never knew what hit him. He died of an acute cerebral hemorrhagic infarction. From what I’ve been told, it’s basically an aneurysm that burst in his head. I hate to admit that we were not as close as we could have been. We honestly were from two different worlds. He had the Army and I am a Pastor. I miss getting to call him on days like today and on Veterans Day to tell him how much I appreciate his service. This is therapeutic for me tonight, so thanks for reading. If you know a service person, thank them for their service. They won’t want to here it. They will tell you, as my brother would say, “I’m not a hero, I’m just doing my job.” I won’t get on my soap box about how we need to take better care of our veterans, but if you see one in need, help them out. What they have endured is more than I ever want to. They deserve more than what they receive from their retirement. Thank You Sgt. Nathan Joel McCool for your service. I love you and miss you terribly tonight! So here’s what we need to do. 1.How do I want to be treated in life? I’m sure as you’re reading this, you’re not thinking “Man I sure wish someone would be rude to me today”. So can you model how you want to be treated today? If you want kind words give kind words. I realize this doesn’t always work, but the more you practice the better you become and the more it comes back to you. 2.Can you do an act of Kindness today? I know the obvious answer is yes, but it can be difficult if you are not intentional about. Make a note to do something kind today. Before you go to bed tonight look at the list and see what you accomplished. 3.How do you respond to others? Do you respond to others the way that you would want to be responded to? When you respond with kindness it affects others. The book of Proverbs says a soft answer turns away wrath, so defuse the next volatile situation with a soft answer. Instead of fueling the argument, end it with a soft answer. Your mission is to teach today. Make your life count. Affect the next generation by showing them how to be a responsible adult. Teach by your actions. Go change the world. Stand. Such a simple word. A word of seemingly little to no action, yet this can be the hardest thing you ever do. Stand. It’s simple right? Stand by definition is “to be in an upright position”. The question today is Are you standing? Has the things life has thrown at you succeeded in knocking you down or are you still standing? Let me encourage you today. The Apostle Paul in his letters made various references to standing. He said, Stand fast, Stand in the Faith, to stand not in wisdom but in the power of God, Stand in liberty, Stand against the wiles of the devil and most importantly Having done all to stand, Stand! To Stand is tiring. In a literal sense, we have all heard it said “I’ve been on my feet all day”. It’s not always fun to stand. While we know that it is strenuous to stand physically, Paul was taking about spiritually. It’s lonely standing by yourself. Ask the three Hebrew boys in Daniel 3. The thing is, they had already made up their minds they were going to stand, before the king asked them to bow. How do we know this? Their statement to the king was “We are not careful to answer you in this matter”. They had already decided where they stood. They were not going to conform and bow to the golden calf. I think there are a few things that need to be talked about here. 1. Where are you going to stand? What are the non-negotiable things in your life? Some where you have to draw the proverbial line in the stand and say this is where I stop giving up ground. 2. What is it worth to stand? For Job in scripture, it was worth everything to not curse God. Are you willing to die on the hill you’re fighting for? You need to decide what its worth before you draw the line. 3. How will you stand? Will you be vocal or silent? Will it be a personal stand or a public one? You have to decide. Sometimes a private stand becomes public whether we want it to or not. Are you ready for that? 4. Lastly, When are you going to stand? I’m sure we have all heard the story of the pet snake that got out of it’s cage and into the baby’s crib. My question is Are you trying to control somethings that you should be standing against? Do you have a ‘snake’ in a cage when it shouldn’t even be in the house? Will you take a stand before it’s too late? So take a personal inventory. No one can make you take a stand. Ask yourself, where, what, how and when. Then, in the words of Nike, “Just Do It”. What are you waiting on. There in no better time and no better place than here and now. Now that you have decided to stand, know that there are people who believe in you and will help you. It’s up to you to do all, to stand! It’s time to take a selfie. We all know what a selfie is. The internet slang dictionary says it is a Picture of yourself, usually taken by yourself. We all know someone who we wish did not take so many selfies. It seems they post a new one every hour. Okay, that might be a slight exaggeration but it is at least one a day. We seem to be enamored with our appearance and how many ‘likes’ we can get. It’s to the point that there is an entire industry associated with selfies. We have photoshop and the like. We have selfie sticks and timers on our cameras. We want people to see the best us. While we are enamored with our outward appearance, our inward self seems to go unchecked or unexamined. The Bible speaks much about self examination. Paul tells the Corinthian church to “Examine yourselves, to see whether you are in the faith. Test yourselves. Or do you not realize this about yourselves, that Jesus Christ is in you?—unless indeed you fail to meet the test!” If we would take an inward or spiritual selfie, what would we see? We enjoy good comments about our selfies but what would people say if we could post a spiritual selfie? I will admit I’m not sure I would always want my spiritual selfie out where everyone could see. The reason is not that I don’t want to be transparent, rather that I wouldn’t want to deal with the judgment of some. Therefore it is important that I do a selfie. We like to use the verses in Matthew 7 about not judging but have you read beyond the first two verses? The point Jesus was making was not so much about not judging but more about self evaluation. The third verse begins the discourse on the speck in your brother’s eye and the log in your own eye. In other words before you try to help someone else, check yourself. I have often tried to paint the picture of a log and a speck. If this was literal, can you imagine someone with a log sticking out of their eye trying to get close enough to get the speck out of someone’s eye? If you are seeing the mental picture I am, it’s quite hilarious. Here is the problem with self examination. Proverbs 21 says that every man’s way is right in his own eyes. When we do a selfie, we must be careful to be honest. Am I comparing myself to others or to a set standard? If you compare to others then you are probably going to find someone who is not quite “as good as you” so you can justify your attitude or action. That is why the Psalmist said in Psalm 26, Examine me, O Lord and prove me. When we do a spiritual selfie, we must do it prayerfully. As we invite God into the equation, he helps us be honest. When we do a spiritual selfie, it’s important to fix what is wrong, not with photoshop, but really work toward getting better. Here is the challenge for today. Take some time for self reflection. Be honest. Do you like what you see? If not work toward change. It may not happen all at once but it will happen if you keep at it. Trust. It’s a word we hear a lot but one that is hard to do. Believe it or not you were born to trust. As a toddler, you would jump from heights into your parent’s arms if told to. It comes with training that we become untrusting. We are told “Don’t talk to strangers” and “If it sound to good to be true, it probably is”. As we grow and mature, we bring this attitude of distrust into our relationships. We sign contracts so that we don’t get taken advantage of. Distrust is a trained part of our make. So when we come to God we tend to be distrustful. We have to retrain ourselves to trust. The Bible is full of verses that direct us to trust. Some are straight forward: Proverbs 3:5-6 (KJV) 5 Trust in the Lord with all thine heart; and lean not unto thine own understanding. 6 In all thy ways acknowledge him, and he shall direct thy paths. These verses are tell us to Trust the Lord. While Proverbs is straight forward, Paul is more subtile in he’s approach when he says in 2 Corinthians 5:7 (For we walk by faith, not by sight:). Faith requires trust. We must trust in what we cannot see. What areas do you need to increase your trust? It’s most likely related to a relationship. I realize that when trust is broken that we find it hard to rebuild it, but if you are going to succeed you have to trust. Let’s look at three areas trust is important. We must trust God. This can be difficult if we feel like God has let us down. Sometimes we feel like God doesn’t have our best interest in mind. This is when we have to trust him the most. Paul tells us in the book of Romans 8:28 And we know that all things work together for good to them that love God, to them who are the called according to his purpose. We have to learn to trust God. We must trust in relationships, whether it be marriage or with friends. Do you trust others? Are you trustworthy? Again trust is a difficult thing to give when you don’t feel it’s deserved. So set some guidelines, but you have to trust if you are going to make it. Start small. A small amount of trust is a start. We need trust in our work environment. There is a great amount of distrust in the workplace. We are not convinced that our superiors have our best interest in mind. While I’m sure there are some that take advantage, most employers want good employees and want the best for them. Can you trust your employer? If you don’t feel like you can, then it might be time to move on. Trust those around you and they will return trust. You might be surprised how your work environment changes. We have heard that trust is not given, it’s earned. While I understand the premise, I want you to trust someone today. Maybe it will change their life and yours as well! Why can’t we be happy for one another? It seems that we can’t celebrate someone else’s win. In the news the last week there have been at least two different examples of this. First was “Deflate Gate” as it was called. The New England Patriots beat the Indianapolis Colts, in a game that was never really close. Almost immediately, there was talk of under inflated footballs. Why can’t a team be good without cheating? I will not debate the advantage an under-inflated ball might give, but the game wasn’t close. Even the Colts made that statement. We seem to look for the negatives in everything. The top story on Yahoo News today is that the crowd at the Miss Universe Pageant booed the placement of Miss Jamaica. Again, why can’t we just accept the judges decision and move on? We seem to question everything. To ask the age old question “Why can’t we just get along?”. We don’t have to agree on everything to get along. I can be civil and tolerate someone that I don’t agree with. notice Romans 12:15 Rejoice with them that do rejoice, and weep with them that weep. This verse tell us to rejoice and weep with them, it says nothing about getting along with them. One of the hardest things you will every do is rejoice with someone you feel doesn’t deserve the win or what they received. It is so much easier to talk about how they were able to ‘cheat’ or get an advantage, or to discuss why they didn’t deserve to win. I wonder what would happen if we made it a point to rejoice with those that rejoice. If we chose to have discussion instead of arguments. What a different world we would live in if we tried to understand where people were coming from with their point of view. What if we tried to get along instead of just arguing our point. In Isaiah 1:18 the Lord says let’s reason together. When we reason together it’s more than discussing or arguing, it’s trying to find the why. If we would find the why, it might help us to understand the individual with whom we are talking. Today, let’s try to get along. I don’t have to agree with you to get along. let’s endeavor to live out the words of Romans 12:18, (ESV) If possible, so far as it depends on you, live peaceably with all. Start with today, then tomorrow. Do it one day at a time. If you don’t make it, start over until you get it. Remember, it depends on you. (ESV) Finally, brothers, whatever is true, whatever is honorable, whatever is just, whatever is pure, whatever is lovely, whatever is commendable, if there is any excellence, if there is anything worthy of praise, think about these things. There are eight things mentioned in this verse: true, honorable, just, pure, lovely, commendable, excellence, and worthy of praise. So here’s the challenge. Find four people and throughout the day tell them something that falls into these categories. Here’s how it works: You have to compliment them eight times. Something that is true might be “You are a good______” and you fill in the blank. Remember it has to be a compliment. You can’t say “You’re good at causing trouble” even though it may be true, its not a compliment. Here are some example compliment starters that we have use at the charter school I work at. Honorable or The word I like Integrity: You showed integrity when you…. Just or Fair: You were fair when you…. or Thank you for being fair when…..
Lovely: Give a genuine compliment. You look nice today. or That _____ that you did looks good. Excellence: This one should be easy. What are they good at? Tell them. Praise worthy: Again we should be able to find something praise worthy. It might be as simple as saying “You did great holding your composure during that incident”. That’s it. That’s the 4/8 CHALLENGE. Are you up for it? You never know when you will be the one that makes the difference in someone’s life. It could be that your words of encouragement are exactly what they need. If we are honest, we all like a compliment. If you need a compliment try giving one. Who knows, maybe this simple exercise will change you life as well as those around you. OK. Pick your 4 people and get started! Start with four then increase it as you get better at it. As my principal says “Create a great day!” It’s up to you!